Ready! And with a whole week to spare before my first event of 2014 at Loton Park on Easter Sunday. All fixed mechanically and all that horrible white Dulux and those stickers gone. So why am I vaguely thinking of selling it and buying a roadgoing classic car in which I can do hillclimbs and European classic car rallies? Not sure myself. Maybe I’ll change my mind after Loton. We’ll see. Over the winter Aldon Automotive had the car (I only got it back a week ago) and I’ve been fixing up the bodywork. Last year I had an issue with the brakes sticking on – sometimes making it difficult to be pushed down the hill after a run. So the brakes were checked and the callipers stripped down and new pistons and seals fitted. However, Aldon noticed that when on the rolling road there were inconsistent drag readings after lifting off. This was traced to a CV joint. They discovered that the CV joints were not a pair – one being a lightweight one, which was completely worn out, and a regular heavier one which was OK. With that problem sorted it should now be easier for the marshals to push me off the top of Loton and maybe I’ll be quicker getting up there as well. We also replaced all worn wheel bearings. In doing this we discovered that one of the suspension uprights was broken, but we were able to get this welded rather than buy a new one. A very nice job. We also replaced all worn rose joints in the suspension. I didn’t have any major engine work done, just the tappets adjusted. It’s not putting out as much power as it did, but I think it should do for another season. I also had a few little jobs done that have bugged me for a while. Aldon removed a loose joint in the gear linkage and made a new connector and adjusted everything so there is now no slop in it. They also replaced various brackets that had broken over the years – e.g. the plate the the coil is attached to and the bracket that holds the brake bias adjuster. Body-wise all cracks have been repaired and I treated myself to a new screen. So, I’m all set. 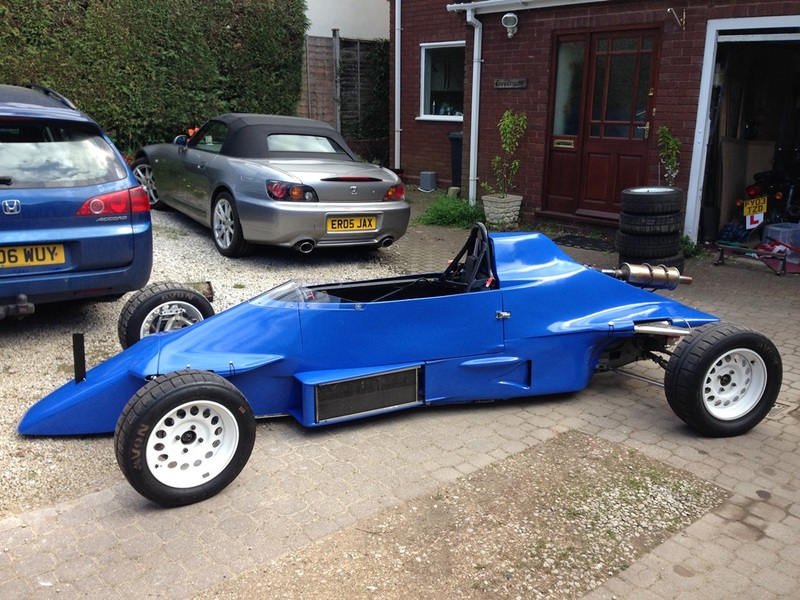 There hasn’t been time to take it for a test drive so my first few runs up Loton will be a little cautious. There are three of us entered in the Formula Ford class – Richard Summers and Samantha Lester in Richard’s 1980 Van Diemen and myself. Unfortunately the organisers have amalgamated the Formula Ford class with the 1600cc Racing Car class (only two cars), who take about 12 seconds less than us to get to the top. Still, this doesn’t really affect me too much since my sole aim is to record a sub 60 second time. That was my aim at the beginning of 2013 too. Hi Bob, shall we see you in France this year. You would be welcome as competitor. Not his year David, though I was tempted to come just to see you getting a haircut. If you see a Renualt Dauphine Gordini for sale, let me know as I want one. Bob – it looks very good. I’m sure all your investment over the winter will pay off. Good luck for Loton and that sub-60 second run. Looks good Bob,bound to be quicker without the Dulux and 85 stickers! That’s an impressive paint job Bob. looks very good, See you at Easter.